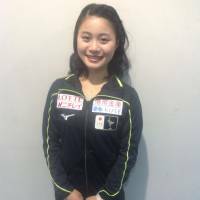 She is the longest of long shots to make Japan’s team for the Pyeonchang Olympics, but in the long view her prospects are very bright. 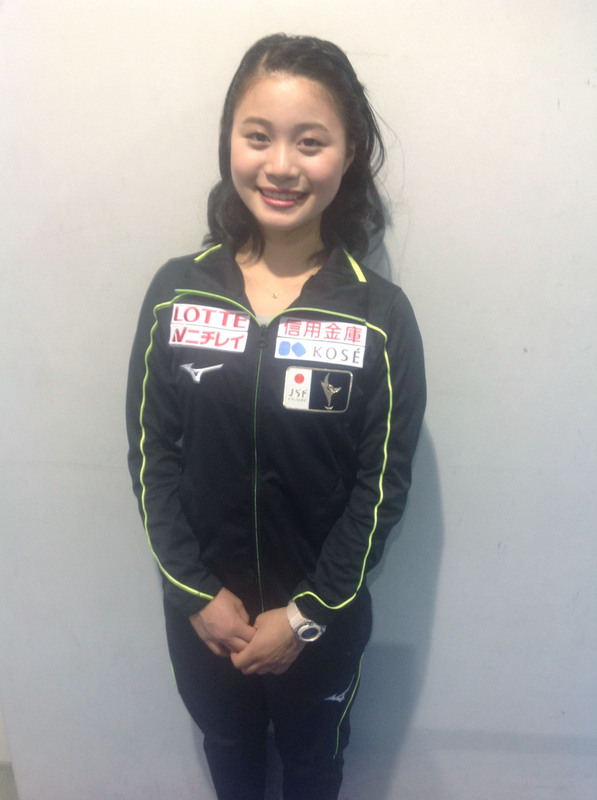 Yuna Shiraiwa is just one of the talented skaters in the stable of coach Mie Hamada at the Kansai University rink. She is often overshadowed by her more prominent training partners in Satoko Miyahara, Marin Honda and Rika Kihira. Shiraiwa, who turned 16 just last week, won’t be skating in this week’s Grand Prix Final in Nagoya, but has made quite the impression in her first tour on the senior GP circuit. Ice Time spoke to her exclusively at last month’s NHK Trophy in Osaka and was impressed by her candor and poise. The Kyoto native stands just 150 cm, and speaks in such a soft voice it is almost a whisper, but her message comes through loud and clear. Shiraiwa placed eighth in her senior debut at the NHK Trophy, then moved up to finish sixth the following week at the Internationaux de France in Grenoble while wowing observers. One of the keys to Hamada’s success has been her long and close relationship with her skaters who seem to get an early start with her. She has been training three-time national champion Miyahara since she was 6 years old. It didn’t take long for Shiraiwa’s parents to see their daughter had great potential. “I began training with Hamada-sensei in my first year in elementary school — around the age of 6,” Shiraiwa stated. I asked Shiraiwa what she felt is the key to the success of Team Hamada. Shiraiwa, who was sixth at the senior Japan nationals last season, said a seminal moment in the history of Japanese skating is what lit the fire for her. Hamada gave Ice Time her thoughts on Shiraiwa last season. Hamada said Shiraiwa’s beauty and soft exterior belie her fortitude. One of the benefits of being part of Team Hamada is the opportunity to train overseas with specialty coaches on jumps and choreography. Ice Time questioned Shiraiwa, who was the silver medalist at the Japan Junior Championships the past two seasons, about this perk. Shiraiwa made quite the splash in 2015 when she became just the third Japanese female to win her first two Junior Grand Prix assignments. The other two were Mao Asada and Miki Ando. Pretty good company to be in. Just to put it into perspective, not even Yuna Kim won her first two JGPs. When Shiraiwa captured her second straight JGP (in Logrono, Spain) in October 2015, ISU announcer Ted Barton was floored by her performance in the free skate. “So sophisticated, so sensitive, so young, so incredible,” Barton said at the time. Shiraiwa’s transition to the senior ranks will take time, but she has won over many analysts already. “She is a lovely, lovely skater,” said Eurosport’s Mark Hanretty after watching Shiraiwa’s short program to “Girl with the Flaxen Hair” at the NHK Trophy. “I particularly appreciated her flow and ice coverage. As with so many of the Japanese skaters, a really soft knee bend which facilitates good flow. Howarth singled out Shiraiwa’s jumping in his analysis. Three-time U.S. champion Johnny Weir believes it is good for Shiraiwa to be competing with the seniors during an Olympic season. “She has a really nice style to her jumps and technique,” Weir said on NBC after watching Shiraiwa’s free skate to “Pictures at an Exhibition” at the NHK Trophy. “Yuna skates very much on top of the ice and on top of the music. That’s something that comes with experience, especially performing in front of large audiences. Nagano Olympic champion Tara Lipinski reiterated Weir’s feelings about Shiraiwa debuting in an Olympic campaign on NBC. “It’s really all about timing and the year that you come into it all,” Lipinski noted. “Coming in as a newbie during an Olympic season is not easy. Shiraiwa admitted after the NHK Trophy that she had felt some jitters going up against the older skaters for the first time. She sure didn’t show it the second time around in France. Shiraiwa, who has been working on both triple axels and quads in practice, was in third place after a scintillating short program at the Internationaux de France that had analysts raving. Hanretty noted her solid fundamentals. The Olympic Channel’s Tracy Wilson liked Shiraiwa’s flow in Grenoble. Ice Time wanted to know what areas Shiraiwa felt she should get more adept at going forward. I wondered who were the foreign skaters Shiraiwa looked up to. Has Shiraiwa’s move up to seniors brought her more recognition from the public? “Recently I felt many people approaching me and calling out to me,” she said. Shiraiwa spends what little free time she has on “photography and window shopping,” she disclosed. She counts South Korea’s Lim Eun-soo and Russia’s Alisa Fedichkina and Anastasiia Gubanova among her best foreign skating friends. Despite her sixth-place finish in the free skate in Grenoble, Hanretty was awed by Shiraiwa’s performance. “She said that she meditated before the short program,” Hanretty said. “I don’t think I’ve heard of a 15-year-old meditating to guarantee their personal best. She’s obviously got a good head on her shoulders. She is a mature young lady. The highly intelligent Shiraiwa had a final surprise for Ice Time at the end of our interview, when I asked her thoughts about what she would do many years from now when her competitive skating career is over. World silver medalist Shoma Uno will be the favorite this week at the GP Final in his hometown , where he will take on a field that includes U.S. champion Nathan Chen, Russia’s Mikhail Kolyada and Sergei Voronov, and Americans Adam Rippon and Jason Brown. Brown was added to the roster last week after China’s Jin Boyang withdrew due to an injury. Wakaba Higuchi and Miyahara will vie for medals in the women’s competition against Russia’s Alina Zagitova and Maria Sotskova, Canada’s Kaetlyn Osmond and Italy’s Kostner. Miyahara moved into the main draw last week after two-time world champion Evgenia Medvedeva withdrew due to a broken metatarsal in her right foot. If another skater pulls out, Kaori Sakamoto would be the next in line to enter the event. Rika Kihira will be taking on five Russians in the women’s JGP Final. Kihira, who won the Japan Junior Championships last week with two stunning triple axels in her free skate, will battle Alexandra Trusova, Sofia Samodurova, Alena Kostornaia, Daria Panenkova, Anastasia Tarakanova. In the event of a late withdrawal, Mako Yamashita would be added to the field. Mitsuki Sumoto, Japan’s new men’s junior champion, will go up against the likes of Russia’s Alexey Erokhov and Makar Ignatov, and Americans Alexei Krasnozhon, Camden Pulkinen and Andrew Torgashev in the men’s JGP Final.